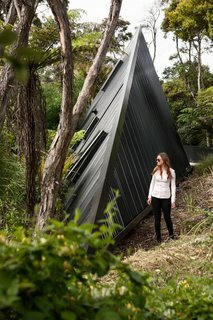 On Waiheke Island near Auckland, New Zealand, the Tent House sits among wetlands on a patch of undeveloped land. It captures the back-to-basics simplicity of camping, thanks to architect Chris Tate. Though he originally created the cabin to be a personal retreat/studio, Tate ended up experimenting with the design in order to challenge conventional expectations of what makes an ideal weekend escape. Now available for short-term rental, the one-bedroom, one-bathroom, 753-square-foot home includes a sleeping area on the mezzanine, a fully functional kitchen, an open-plan living area, and a front deck designed to "fan out"—giving the illusion of a shadow cast by the A-frame structure. The tent-like home responds to the challenging site in a dynamic way. 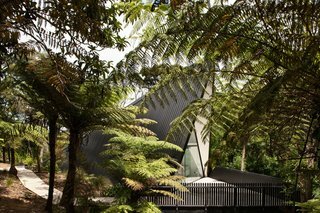 Situated in the New Zealand rain forest, the Tent House perfectly integrates into its sylvan setting. The site was landscaped with hundreds of plants exclusive to New Zealand in order to recreate the natural native forest. As a result, many native birds have returned to populate the location. 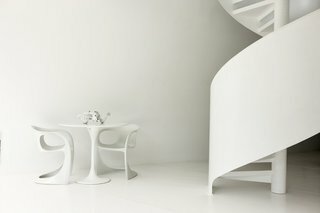 "Every time I visit the house, I get excited by the complexity and simplicity of its form. It has that 'happy place' feeling for me," says Tate. 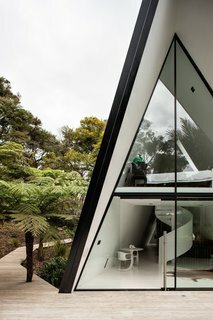 The self-taught architect, who has been practicing in Auckland with a team of architects and engineers for approximately 10 years, explains the building process as being "very hands-on and experimental." He continues about working closely with architecture students, "We did the foundations, floors, and framing—and had professionals take over with certain services, cladding, etc." 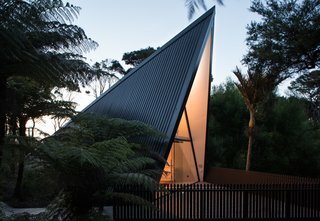 The sharp ridgeline and soaring soffit reference a tent shape in an architecturally elegant way. Tate is now embarking on setting up a satellite design practice in Los Angeles with a local partner. "We absolutely love the West Coast and we strongly believe that our buildings—which are often based on the modernist movement—are well-suited to California, which made it an easy choice," he explains. A lack of walls and doors generates a compact yet continuous space for living. The Tent House has been shortlisted for the World Architecture Festival in Berlin 2017. It can be rented out for short-term rentals and photo shoots here. 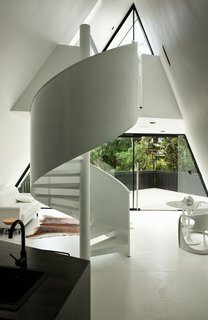 Inside, the complex interplay of angles creates an energized feeling of space that belies the modest floorplan. 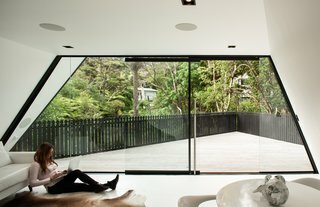 This is enhanced by the full-height glazing on the north face, which draws in the deck and the wetland bush beyond. Set in the New Zealand rain forest, it's landscaped with hundreds of plants that are exclusive to New Zealand in order to recreate a natural native landscape. The front deck was designed to "fan out"—giving the illusion of a shadow cast by the A-frame structure.